After being back from Africa now for a little more than three weeks, I have managed to get caught up with piles of paperwork, and am happy to once again be in the wilds of northern New Mexico hunting Antelope. 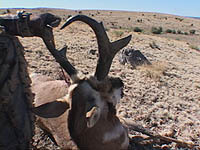 I am hunting antelope on the T O Ranch, just west of Raton; a very large property with a variety of game including elk, mule deer, black bear, mountain lion, and of course, antelope. I arrived yesterday afternoon and, once settled in at the headquarters, went out and shot my bow to make sure my sights were properly aligned after traveling. I then took a hike up into the hills behind the lodge to get a little exercise. It wasn’t long before I bumped a mule deer doe, and as I climbed higher, saw several more feeding in the oak brush. Continuing up the ridge I found an overlook that gave me good vantage over the oak brush choked canyon below. I couldn’t resist pulling out my predator call to see what might happen. Almost immediately after blowing it the first time, a 5×5 bull elk came barreling out of the brush where he had obviously been bedded. Soon after his exit a black bear popped out about 200 yards to his right. He moved towards me as if interested in the call, but soon began feeding in the oak brush on new acorns. I tried to bring him closer with the call, but to no avail. I then decided to see if I could get in bow range even though I had no bear tag, or my bow. As I was still a ways above him I began sidehilling slowly in his direction. He continued feeding up the hill and I saw a good place to try and intercept him. 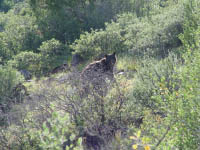 The hill was steep with lots of loose rock, but I was able to move quietly around until I was within 44 yards of him, without him knowing I was there. Since I had neither weapon or bear tag, I pulled out my Sony F717 Digital camera and “shot” him with that! 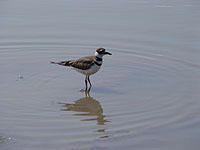 Granted, it is not the same as nailing him with an arrow, but it sure made a nice photo. After several shots, he became aware of my presence and made his exit. It was thrilling to be so close to what I estimate was a 250 pound predator without a weapon! I wasn’t worried about him bothering me as he did not react aggressively to the predator call. Typically, a well fed bear is not a danger to humans. 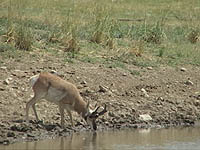 It is now 12:43 and I still have not had any antelope visit my waterhole. This is beginning to remind me of last year’s hunt in Arizona, where I sat for two days and only saw one buck. He was a very good buck and I did end up getting him with a long shot on the second day. 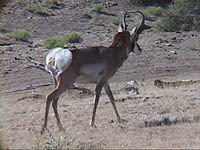 The blind was set up for the antelope to approach from the North, as they had been doing the previous day. As is usually the case, they chose to come in from the South, and the lead doe caught a whiff of me and retreated up the hill. Cade green was filming for me and was positioned about 75 yards behind me on the side of the hill. The big buck passed within 15 yards of him! Oh how I was wishing we could trade places. As the buck move up behind the doe, I ranged him and took the shot, hitting him perfectly. He only ran about 75 yards before going down. Amazingly, Cade was able to pivot the camera around behind him, and was able to catch the arrow as it entered the buck. I still don’t know how he was able to do that, as the antelope was directly behind his blind when I took the shot! 6:16 It has been a long day! I haven’t had any more action since the last report. 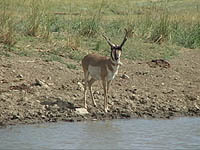 I have seen a few antelope moving through the pasture, but all of them were at great distances. I’m going to give this another 30 minutes, then I am going to check on my hunting partner, Donny Elias. He is in a blind about a mile from me, and I hope he has had more action than I have. we will compare notes and make a plan for tomorrow. This has been one of those days where I have to keep reminding myself that a bad day hunting beats a good day doing anything else. I used my sat-phone to check on some of the rifle hunters and many have already done well. The largest buck taken so far scores 83 inches! There are several others which are all around 80 inches, so the action for them has been great! I will follow up with another report on tomorrow’s hunt. Sunday: Very much the same as yesterday; only two bucks came in and they were both small. Seems as if the horn size is down on the ranch this year. Since I killed such a good buck last year in Arizona, I don’t think I will hunt here tomorrow. sitting in this blind all day is too tough for the size of bucks I am seeing. I have another antelope hunt in Texas scheduled for early September, and the prospects should be much better out there. I will report on the outcome of that hunt as it happens. Take care and good hunting!